Dominican College Sion Hill was awarded the National ‘Well Read’ award for their whole school participation in promoting a love of literature. Debating is a very popular extra-curricular activity and our students have had many successes in various competitions debating in English, Irish, French and German. 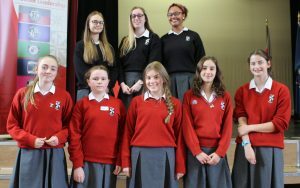 Each year, students take part in a National competition ‘Poetry Aloud’, which is the annual poetry speaking competition organised by the National Library and Poetry Ireland. It is open to all post-primary school students on the island of Ireland. World Book Festival will take place in the school from Thursday 2nd of March. Activities will include table quizzes, toast master competition, spelling Bee, Drop everything and read classes.